Borscht - how can a word have so many consonants and just one vowel? Go ahead, say it, "Borscht". Doesn't it resonate with Central and Eastern European food flavors? For me it calls up two competing soup memories. Is borscht a cool and silky strained beet broth, presented in a clear-glass cup to celebrate its vibrant, neon-red color. Or is it the surprisingly pink peasant soup, meaty and full of chunks of vegetables, potatoes and assertive spices? Borscht can be both of these, and more. I don’t remember eating borscht as a child. It really became a dine-out treat for me during our early-married years, after we discovered BarneyBagel and Susie CreamCheese, a tiny restaurant on one of Seattle’s downtown piers. We lingered over those steaming bowls of soup, warming up after wet and windy walks along Alaskan Way/Elliot Ave. I can still picture the trifecta of budget-friendly restaurants in that waterfront neighborhood - Barney Bagel, Shakey’s Pizza and The Old Spaghetti Factory. In visit after visit I pestered the Barney cook to share his borscht recipe. He finally granted me a quick peek inside his binder of secrets, but whisked it away when I began to take notes. There began my ongoing search for a Best-of-Borscht recipe. The search continues today, decades later. During a past boat trip we found borscht featured on the menu of the BayView Restaurant in Sitka, Alaska. The harbor view from that second floor eatery was captivating, but it was the borscht that brought us back repeatedly. And then the BayView sold, the menu changed, the soup disappeared... drat! Sitka has a strong Russian heritage; wouldn’t you think borscht would be easy to find in local restaurants? Not so. But I digress. My current borscht recipe has a varied history, leaning heavily on The Good Cook: Soups by Time Life (1979), and The Best Recipe: Soups and Stews by Cook’s Illustrated (2001). More recently Seattle chef Greg Atkinson published a more modern version of borscht (here and here). We differ in some ingredients and procedures, but his text is interesting and his directions clear. I don't mind spending two days to prepare the soup, but there are shortcuts that can simplify the process. Homemade beef stock takes 3 to 4 hours, from start to cooled finish. Canned beef broth, or jarred beef base can substitute, but you don't get the same full-bodied flavor punch from a can. "Authentic" recipes call for raw beets and fermented beet liquid, but I happily substitute canned beets with their juices, then add lemon juice and red wine vinegar. For a more pronounced sweet/sour flavor dried cranberries and/or raisins join the mix. Dill weed is traditional, but fennel and caraway seed add interesting back notes to the broth as well. After all these years, borscht development is still a work in progress. Heat the oil in a large Dutch oven or stockpot over medium-high heat. Brown the meat, bones and onion halves on all sides in 3 or 4 batches. Do NOT crowd the pan or the meat will steam instead of brown. It will take 15 to 20 minutes to brown all the meat. Set all aside on a platter. Deglaze the empty pot with red wine, scraping up the browned bits with a wooden spoon, and reduce to a syrup, about 2 minutes. Return the browned meat, bones and onion to the pot. Reduce the heat to low, cover the pot and cook until the meat has released its dark juices, about 20 minutes. Increase the heat to medium-high and add the boiling water and salt. Bring to a simmer, reduce the heat to low, partially cover and simmer gently until the meat is tender, about 2 hours. Strain the stock, discarding the solids. Set the meat aside, reserving half for other uses. Cool the remaining meat to be used in the soup, then shred it into bite-sized pieces. Before using, cool and defat the stock. The stock and meat to be used in the soup can be refrigerated separately in air-tight containers for up to 3 days. This recipe makes a scant 2 quarts of stock. Heat butter in a large stockpot or Dutch oven over medium heat. Add onion and carrots; cook, stirring occasionally until softened but now browned, about 5 minutes. Add the garlic and cook until aromatic, about 30 seconds. Add tomato paste; stir in 1/2 cup of stock to dissolve the tomato paste. * Add the remaining stock, cabbage, beets, vinegar, sugar, caraway and fennel seed if used, 2 teaspoons salt and the bay leaf. Bring to a boil, lower the heat, simmer until vegetables are soft and tender, about 45 minutes. Meanwhile, place potatoes in a saucepan, cover with cold water and add 1 teaspoon salt. Bring to a boil, lower the heat, cover and simmer about 10 minutes, until soft in the middle when pierced with a thin paring knife. Drain potatoes, cool slightly, and quarter or cut into 1 inch chunks. Stir the meat into the pot and remove the bay leaf. Taste and adjust the seasonings, adding pepper, additional vinegar as needed and 1/4 cup dill. Add half of the potato chunks to the individual soup bowls and ladle some soup over the potatoes. Top with additional potatoes, a large dollop of sour cream and a generous sprinkling of dill. Serve immediately. *Note: if you prefer a thicker broth, use cornstarch or flour to thicken. Black bean soup provides a world-class cure for the winter weather blahs. It’s true, this soup wraps a comforter around your shoulders and beams sunshine on your soul. January has officially been declared Soup Month, and black bean soup is a fine choice to celebrate the occasion. We have enjoyed this soup for decades, although the recipe and the toppings have changed a bit over the years. An old secret ingredient (orange halves, rind and all) came via my Mom from a Los Angeles Times clipping in the ‘70’s, while chorizo is a more recent addition. Who knew about chorizo in the 70's? Some versions have featured chopped chiles, while others added chopped carrots and celery. Each recipe tweak adds a new flavor nuance without changing the basic character of the soup - unless you are picky about authenticity. Cook's Illustrated: Soups does a masterful job of explaining how they fine tune a recipe for flavor, texture, appearance and ease of preparation. The black bean soup recipe covered less than a full page of text while the development notes took a page and a half. The old Time-Life classic, The Good Cook: Soups fits two black bean soup recipes on three-quarters of a page! Ingredient lists and simple directions are routine , but in the Time Life cookbook I miss the story of recipe creation. Reading the Cook's Illus. narrative - what worked, what failed to make the cut, and why - helps guide my recipe "tweaks". Is black bean soup a Cuban/Caribbean standard? a TexMex classic? I suppose the answer depends on the source and some minor differences in ingredients. Beans, garlic, onions, cumin and bay leaves are components of dishes in many regions. With the exception of the specific bean, even the recipe for Red Beans and Rice doesn’t differ greatly in ingredients or procedure, but it is definitely a Creole/Cajun dish. Whatever the attribution, this soup is a winner. Based on The Best Recipe:Soups and Stews by the editors of Cooks Illustrated, with influences from a host of other recipes over time. 1. Soak the beans overnight, adding enough water to cover by at least 2 inches, OR bring the beans and water to a boil, remove from the heat, cover and let stand for 1 hour. 2. Drain the soaked beans, discarding the soaking liquid. Place the beans, ham hock, salt and pepper, water and broth in a large stock pot. Bring to a boil; reduce the heat to low and skim off the scum as it accumulates. 3. When no more scum rises add the onion, garlic, bay leaves and orange halves; stir and return the pot to a low boil. Simmer, partially covered, for about 2 hours or until the beans are tender but not yet bursting. 4. Remove the orange halves from the bean pot. Remove the ham hock and let it cool. Remove the meat, leaving behind the bone, skin, gristle and fat. Cut or shred the meat into bite-sized pieces and stir it back into the bean pot. Adjust the seasonings. 1. Heat a large skillet over medium heat. Add the chorizo and saute until it renders its flavorful oils. 2. Add the onion and red pepper and saute until softened, but not browned, 8 to 10 minutes. 3. Add the garlic, oregano and cumin and saute until fragrant, about 1 minute. 1. Scoop 1 1/2 cups of beans (use a slotted spoon) and 2 cups cooking liquid into the sofrito mix. Mash the beans with a fork or potato masher until smooth. Simmer, uncovered, over mdium heat, until the liquid is reduced and thickened, 5 to 10 minutes. 2. Add the sofrito mixture to the bean pot. Simmer, uncovered, until the flavors blend, about 15 minutes. 3. In a small bowl mix the cornstarch with 2 tablespoons cold water and form a smooth paste. Stir the paste into the soup and stir until thickened, about 5 minutes. 4. Remove and discard the bay leaves. Stir in the lime juice and adjust the seasonings. 1. The soup tastes best the next day, after the flavors mellow and blend. 2. If pressed for time, 5 cups of canned beans, drained and rinsed, can substitute for 2 1/2 cups of the dried. Remember to use less liquid and to reduce the cooking time so the beans don’t turn to mush. Canned beans work, but I prefer the finished result using dried beans. 3. When drained the beans make a good SW side dish, can be the base for refried beans, or even fill a taco or burrito. Kale adds color and spark to a bowl of cannellini beans. It works in bean soup or gumbo z'herbes, frittatas, stovetop hash, pasta sauces, or even as a pizza topping. I frequently saute it gently with garlic and scallions, then toss with dark balsamic vinegar and pine nuts, and top with lemon zest... mmm, delicious. Could you enjoy crispy, fried kale chips? why not? You might get bonus points for healthy eating. Cooked kale is the norm in my kitchen, so I was surprised to find a recipe featuring raw kale with some familiar ingredients. It was intriguing and certainly worth a try. If the recipe flopped, I could always add it to soup or some other dish. That was not a problem, the recipe is a keeper! We'll enjoy kale salad again, soon. When you find a good thing it's best not to mess with it. 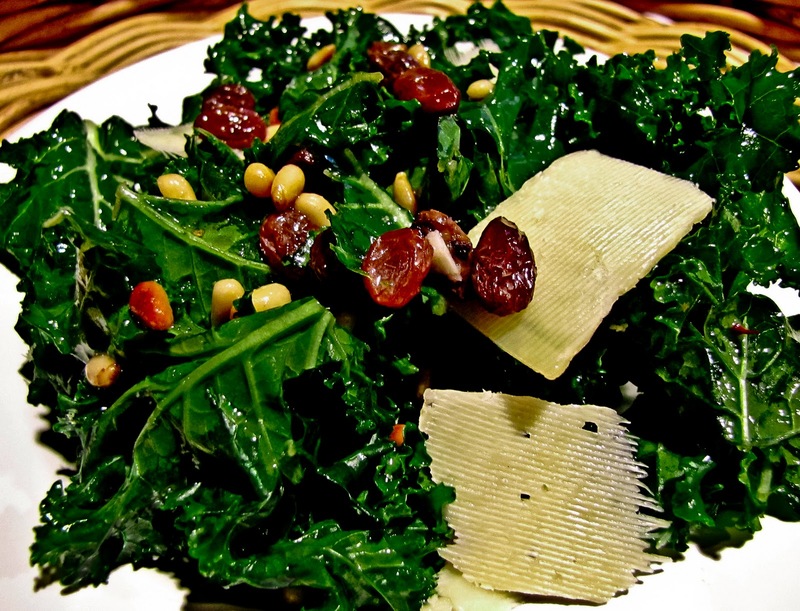 That's certainly true with this recipe for a crunchy winter salad featuring raw kale. (Disclaimer: I might weaken and be tempted to add some bacon chunks to the finished dish) After the first forkful, RL declared himself ready to reject other greens and demand kale for his salads. Here is the original recipe, from Bon Appetit and available online at Epicurious.com. Don't you hate those days, the days when you never slow down but the project list is no shorter? Yesterday was a really busy day, full of a ton of little projects, but few of them on the official To Do list. Oh yes, one of those days. Suddenly it was late and we were hungry, really hungry. I didn't have a menu plan but the fridge held some fresh produce and several small containers of previously cooked "stuff". I explored refrigerator shelves and freezer drawers, mentally tasting a variety of possibilities. You know, the food memory experience, when you consider an ingredient, tasting it in your mind and almost on your tongue. Creating Italian something was the solution. I stuffed five large mushrooms with a braise of kale, chopped mushroom stems and yellow onions, marinated fresh mozzarella balls, garlic and other seasonings. A partially full jar of mushroom and sausage spaghetti sauce mixed with the last portion of my homemade basil fettuccine and topped the mushrooms. Three spicy Italian sausages joined the party and it was oven-ready, almost a whole meal in one baking dish. For dessert we enjoyed some Clementines. These were pretty tasty items to enjoy at the end of one of "those days". Comfy in my sweats and slippers, it was certainly more relaxing than going out for dinner. What do you eat when you are tired and pressed for time? Photo: Basil and oregano top mozzarella top the kale and onion stuffing inside partially cooked 'shrooms on top of basil fettuccine mixed with 'shroom and sausage spaghetti sauce. Photo: Additional spaghetti sauce and a sprinkling of Parmesan cheese top the dish. Lightly brush the outside and inside of the caps with olive. Place in a baking dish or pie pan, hollow side up, and bake about 10 minutes. Remove and set aside. In a small skillet heat the olive oil. Saute onion and garlic until softened, not browned. Add the kale, mushroom stems, basil and oregano, balsamic vinegar and a sprinkle of water; cover and cook over medium heat for 3 or 4 minutes. Uncover and saute until the kale is wilted and the pan is nearly dry. Remove from the heat, set aside and cool to room temperature. Thinly slice or dice the mozzarella and add to the cooled mix in the skillet (reserving some cheese to top the 'shrooms); toss to mix well. Use a spoon to fill the mushroom caps, packing lightly to form mounded tops. Mix 2 servings of pasta (cooked al dente) with a generous amount of prepared spaghetti sauce and cover the bottom of a small oiled baking dish. Place the filled mushroom caps on top of the sauced pasta, spoon more spaghetti sauce on top and sprinkle with Parmesan and the remaining mozzarella cheese. Bake, covered with foil, for 20 minutes. Uncover and bake an additional 10 minutes. Note: Adding some chopped currants, red pepper flakes, black pepper and capers to the stuffing mix sounds tempting for the next improvisation. Lunch with good friends was the perfect way to enjoy the last afternoon of the year. Lunches tend to be relaxed affairs, an easy menu without the pressures of a multi-course dinner, so even the cook can relax. Sarah and Gerry had arrived with champagne and apricot nectar, so the relaxation began immediately with a round of Bellinis. Eventually we got around to lunch and everyone joined in the last-minute kitchen activities of ladling, serving, filling the water glasses, etc. Four hours flew by and the laughter and conversation never slowed. We had a lot to catch up on since we are rarely together in the same state… traveling is both a joy and a problem in retirement. It’s easy to lose touch with people you care about, even in these days of e-mail, texting, Skype, Facebook and Twitter. Although we hadn’t seen each other in a year and a half, not since our 2009 boat trip in SE Alaska, we talked nonstop, occasionally all at the same time... and still have ideas to explore and stories left to share. 2010 ended with a memorable cold and awesomely sunny day. The delicious Thai soup provided a comforting antidote to Seattle's cold weather, and the rest of the dishes offered a variety of nibbling choices. Whenever we eat this fragrant, tasty soup again I know I will think of this visit with our Montana friends. Dessert was decidedly non-Asian with fresh pineapple rounds sprinkled with brown sugar and broiled, then topped with whipped mascarpone. Place the mushrooms in a small bowl and cover with 2 cups of boiling water. Soak for 20 minutes, or until the ‘shrooms rehydrate. Drain, but save the soaking water, and cut the larger pieces into bite-sized chunks. Set aside. In a medium-sized soup pot or dutch oven heat the oil over medium heat. Add the lemongrass and ginger and cook until fragrant. Add the garlic and cook for another minute.Tear the lime leaves apart and add to the pot, then cook for an additional minute. Add the coconut milk and stir to blend completely. Add the mushrooms, chicken, peapods and carrots and cook at a simmer until the chicken is no longer pink. Serve in heated bowls with a small scoop of Fragrant rice. Top with a sprinkling of sliced green onions and shredded Thai basil and/or mint. These rolls used nearly the same ingredients as the Spring Rolls with Pork. Large shrimp were briefly poached in boiling water flavored with ginger and star anise, then drained and chilled. I split each shrimp lengthwise and used 3 or 4 pieces per roll, along with rice noodles, carrots, cucumbers, julienned Thai basil and mint and a smear of sweet Thai chili sauce.